I was going to wait until I had more of my professional pictures to write about the bridesmaid dresses, but my photographer is very 'artistic' and he takes a long time... which is a good thing because the photos will be phenomenal, but I can't wait until then to share with you these gorgeous bridesmaid dresses! I knew I wanted navy blue, but I originally wanted short dresses...in winter... 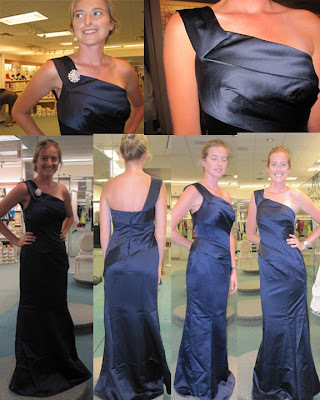 I know... but when one of my girls tried on this midnight colored Vera Wang long gown, we were sold. 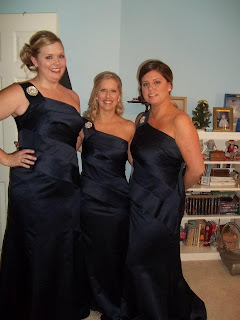 You may remember this post from last year when we went to David's Bridal the day the Vera Wang bridesmaid dresses went on sale -- I had my heart set on the short pouffy dress that ended up looking like cupcakes... yikes! 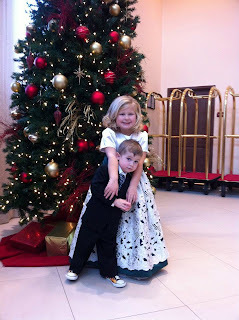 But here is THE dress - this photo is of my bmaid when she tried it on that day last year. 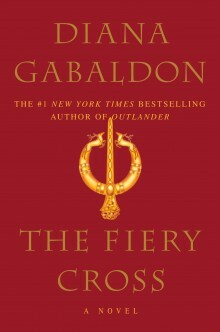 It doesn't come with a broach, but the sales lady suggested adding it and we loved that. 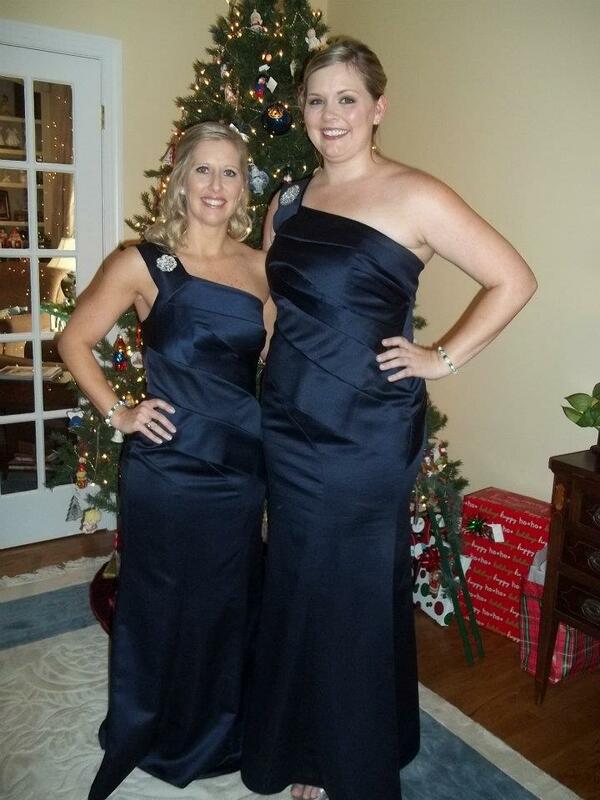 It helped that this bridesmaid totally rocked this dress... we were both like "Wow! This is the one!". I ended up buying each girl a different broach to wear on her dress - I tried to find a different design for each girl that matched her personality. 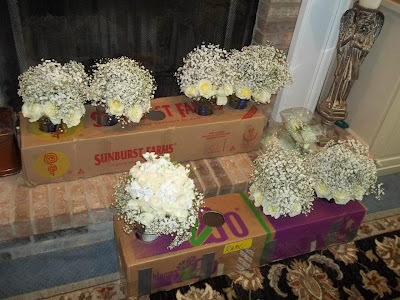 It was part of their gifts along with a monogrammed tervis tumbler and lid, a grey/silver pashmina, a pearl/emerald/rhinestone bracelet, and silver flip flops to wear at the reception. 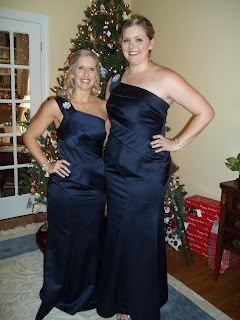 And here are several random photos of my other girls wearing the dress.... these dresses were flattering on every body type. All the girls looked tall and lean... they had pleats in the right places and were just beautiful! For shoes, I just asked the girls to pick a pair of silver shoes they were comfortable in... you couldn't see the shoes anyways, so I wanted them to go more for comfort. My sister, me, my mom. The flowers! The dark navy of the dresses looked amazing with the white rose and babies breath bouquets! The flowers waiting on us - mine are bottom left. roses around the bottom, wrapped in green satin ribbon with pear & rhinestones. I always said that I would never be the bride who says, "You can wear it again!". But... I really think you can wear these again... in fact, my best friend is the same size as me, so I want to borrow hers sometime. Some of the girls even talked about having them shortened into cocktail dresses. Can you believe these dresses came from David's Bridal!?! And...they were less than $200. I was really impressed with the quality for the price. 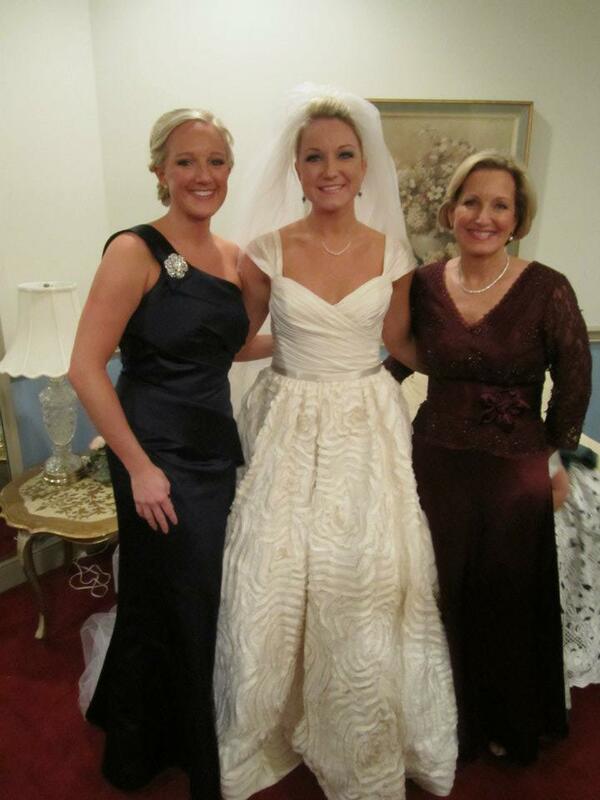 David's Bridal! Who would have thought?? Two of Bradley's nieces were my Jr. 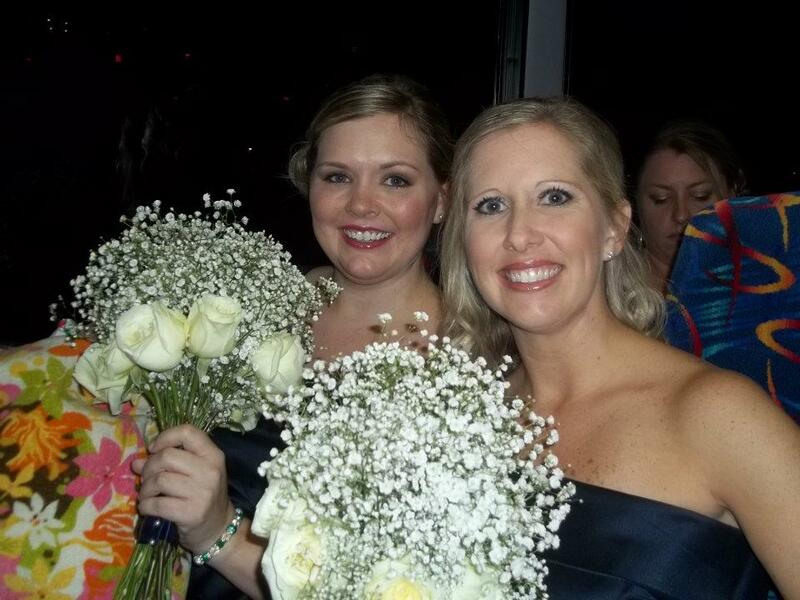 Bridesmaids. I wanted them to feel special, so we decided their dresses would be Christmas green. 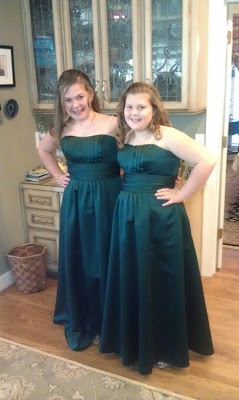 They are 10 and 12, so we also wanted age appropriate and the Bridesmaid gowns were a little mature. David's Bridal (again!) 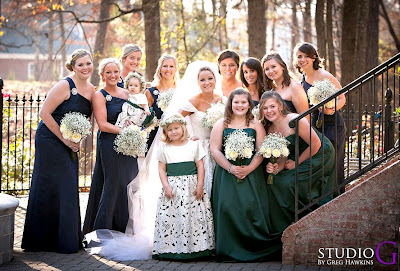 had the perfect Holly green color and the girls picked out a beautiful long dress. 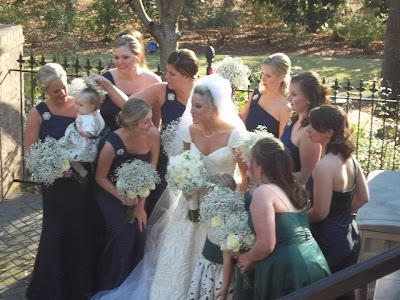 It was strapless, but Bradley's mom added rhinestone straps to the dresses, so they complimented the rhinestone broaches on the Bridesmaid dresses. Finally, Bradley's six year old niece was my flower girl, and my 8 month old niece was an honorary flower girl. 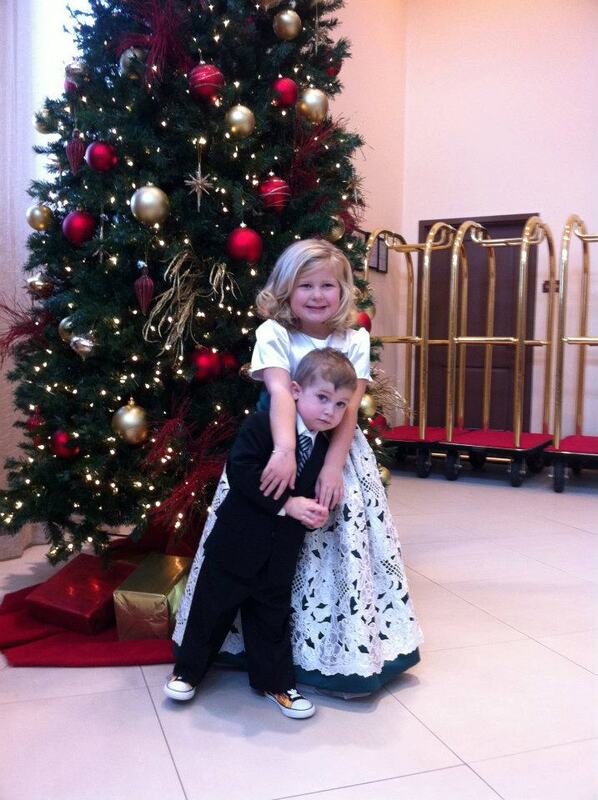 Bradley's mom made their dresses out of beautiful ivory satin and a green satin. 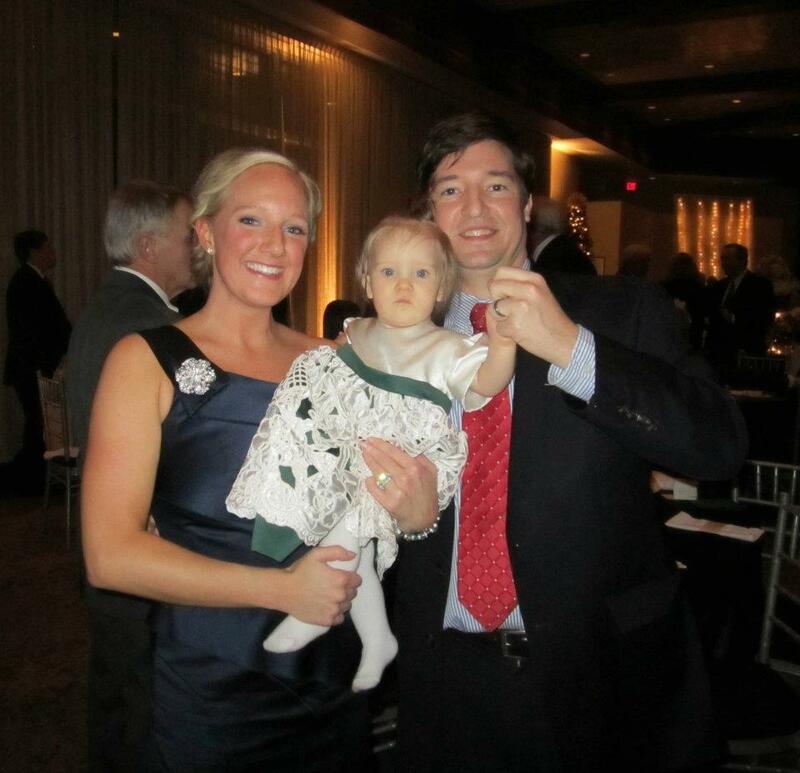 The skirts were made out of a really nice detailed ivory satin fabric that was overlayed on the green satin. Then of course they had green sashes and pearl buttons on the back. 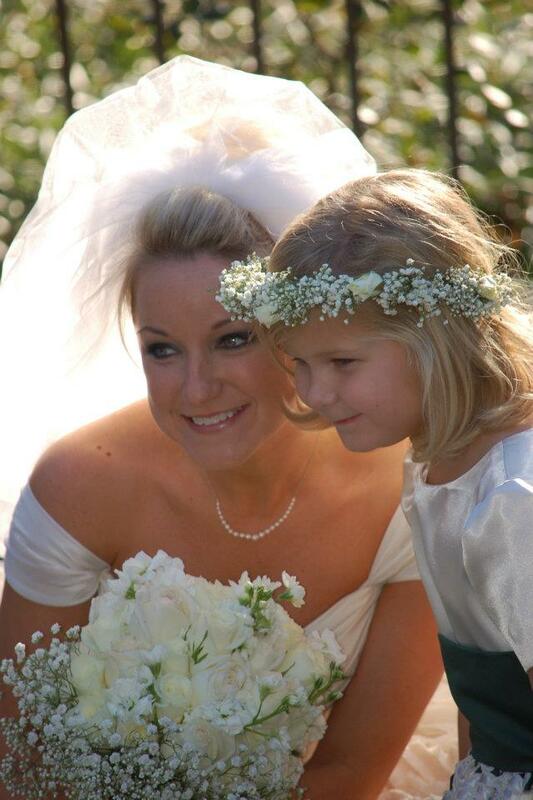 They looked so cute, especially with their babies breath halos. 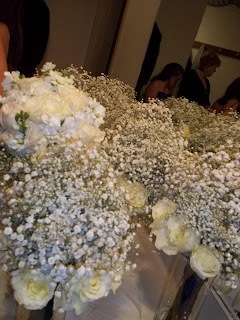 It was really neat to see it all come together - the colors were perfect together and with our white bouquets, it was just perfect! I heart navy and one-shoulder soooo I love this!! 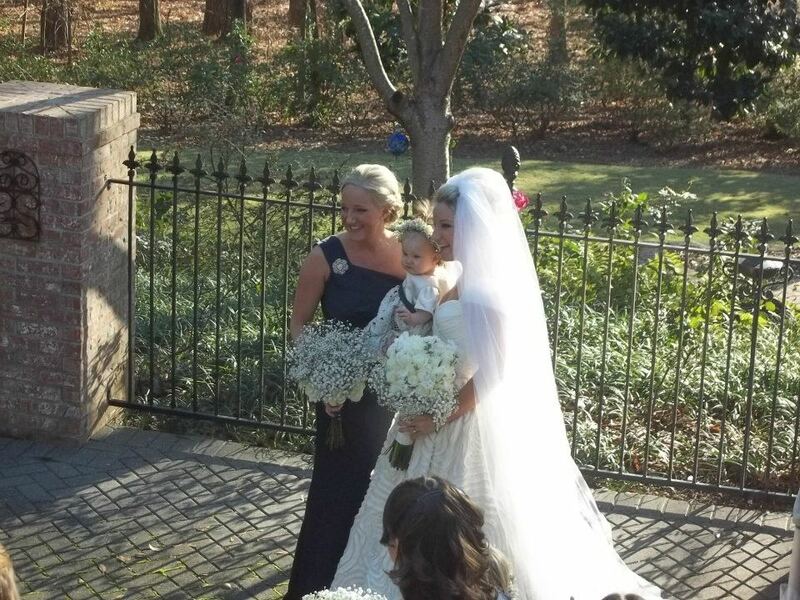 Great choice on the dress!!! I can't wait to see all of your professional shots.